Hamas minister announces Egypt ready to end 'blockade' of Rafah. 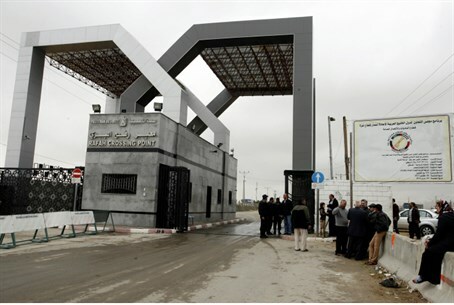 Gaza's Islamist rulers Hamas announced Wednesday that the blockaded territory's border with Egypt would open after a 50-day closure, and told Palestinian Arabs wishing to travel to present their passports. Egypt has severely restricted access through the crossing in the border city of Rafah since July, when the army deposed Hamas's ally, president Mohammed Morsi of the Muslim Brotherhood. The crossing will reopen for three days starting Saturday, Hamas's interior ministry said. Filippo Grandi, head of the UN Palestinian refugee agency (UNRWA) urged Egypt Tuesday to allow people through Rafah, saying only a handful of Muslim pilgrims had been allowed across over seven weeks. Many Gazans travel through Rafah to seek medical treatment. He also called on Israel to ease its blockade of the territory, imposed in 2006 to prevent the smuggling of weapons and explosives. That is unlikely to happen; earlier today, the Israeli navy destroyed two boats suspected of smuggling arms into Gaza, less than a month after naval commandos seized an Iranian arms ship heading to the territory. Humanitarian aid, however, flows freely from the Israeli side into Gaza. After Morsi's overthrow, the Egyptian army took an even harder line than Israel, destroying hundreds of tunnels under the border that brought in construction materials and fuel, as well as weapons and other equipment for Islamist terrorists on both sides of the border. That caused the Strip's worst ever energy crisis, with power outages of up to 16 hours a day. This month, Hamas described the Rafah closure as a "crime against humanity," and the UN criticized it for its effect on "the civilian population, including patients awaiting medical treatment."